Having a problem with setting up your DTV on the island? The Phuket News has found the solution for you. My wife recently returned from her family home down South and brought back with her the standard government-issued digital TV decoder. We plugged the decoder into the TV, connected the antenna, switched it on and set the box to scan for all channels. But it found nothing! Is there no digital TV in Phuket? Why not? Isn't Phuket the "world-class international tourism destination" that the government keeps telling everyone it is? If there is no digital TV yet, when will it come? and what is taking so long? The government and the national media were happy to splash big headlines about this months and months ago – but now they're all silent, much like our digital TV airwaves. Yes, digital TV is available in Phuket. The transmitter was set up on top of Toh Sae Hill in Phuket Town in October last year, but the hills in Phuket make it difficult for some areas such as Patong to receive the signal, and other areas may not receive the signal at all. Two more transmitters – one in Patong and another in Thalang – will be set up sometime next year. 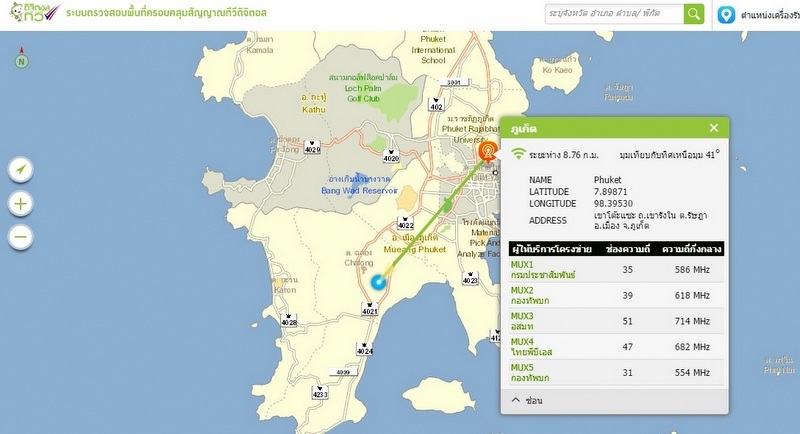 So the signal will cover all areas in Phuket very soon. Right now, I’d recommend that you use an outdoor antenna and plug that into your decoder box. Also, try using a fishbone antenna. They may be more expensive, but they are better at picking up signals. Install the antenna on high ground, point it at Toh Sae Hill and set the box to scan for channels. If you live in Chalong it should be no problem. The decoder box has a two-year warranty. In case your decoder box does not work properly or seems to be broken, you can change it for a new one within 30 days. But after 30 days, we recommend you to negotiate with the vendor who sold the decoder to you so they can buy it back from you and then you pay a little bit more to get a better one. Digital TV currently carries about 28 channels. This will increase to 48 channels in the near future. If you have any more questions or would like more advice, please call the Phuket NBTC office at 076-321961-3. Please note that our former number 076-321037 is no longer in use. – Wanna Setthaphong, Director, Phuket Office, National Broadcasting and Telecommunications Commission (NBTC).